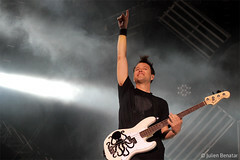 At this point, it’s safe to say that Mark Hoppus is a human dynamo. Best known for his role in potty mouthed pop-punk trio Blink-182, the 38-year-old is more than just a mere bassist, having juggled production duties, podcasts, high-profile collaborations and more in recent years. His newest endeavor? A Different Spin With Mark Hoppus, a weekly, hour-long program hosted by its namesake airing on Fuse starting this September. We caught up with Hoppus to get the scoop on what his new venture is all about, as well as get an update on whether or not we’ll hear new Blink music before the world ends in 2012. On September 26th Blink will play the EpiCenter Concert. 1 Day only break out of the studio! If you are in SoCal, be there!